Everybody knows everybody at the Candle Light Lounge, the Wednesday night headquarters of the Treme Brass Band. When the group strikes up at the small, down-home New Orleans bar, located in the heart of the Treme neighborhood, it often looks more like an orchestra than a brass band. Sometimes as many as 15 musicians swell its ranks, with old friends and eager young musicians stopping by to sit in. Benny Jones Sr. and Lionel Batiste are more than simply the leader and assistant leader of the Treme Brass Band. They stand at the core of the New Orleans brass band community and historically and spiritually represent the neighborhood from which the group takes its moniker. 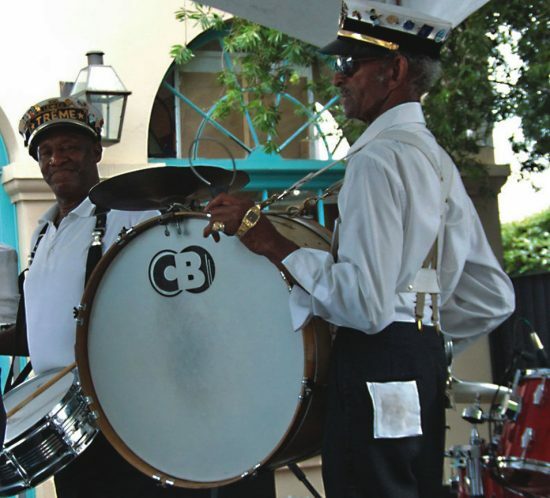 Jones, the mild-mannered snare-man, and Batiste, the ever-jovial bass drummer and vocalist known affectionately by all as Uncle Lionel, grew up in the musically rich Treme. Since childhood they’ve been active in the area’s diverse goings-on: jazz funerals, social aid and pleasure club parades and Mardi Gras Indian and Black Carnival activities. The Treme is the go-to band when folks want to honor a musician or loved one with a traditional jazz funeral. It can be guaranteed that every member will show up with the required white shirt, black tie and pants and hat. The hip-hop, funk-infused brass band style of the next generation doesn’t come into play at these occasions. Tradition in the New Orleans jazz world also means passing on the knowledge and the culture. Young musicians often get their start sitting in with the Treme, and novices have benefited from the group’s regular Saturday morning appearances at a children’s program presented by the New Orleans Jazz Historical Park. It can draw as many as 20 young people. “Sometimes there are so many kids on the bandstand that it looks like us senior citizens have to stand on the outside,” says Jones, whose greatest joy is to make audiences, and especially kids, happy. Just like the neighborhood from which it bloomed, the Treme Brass Band is welcoming. It is of the spirit of the people and remains functional in the life of the New Orleans community.